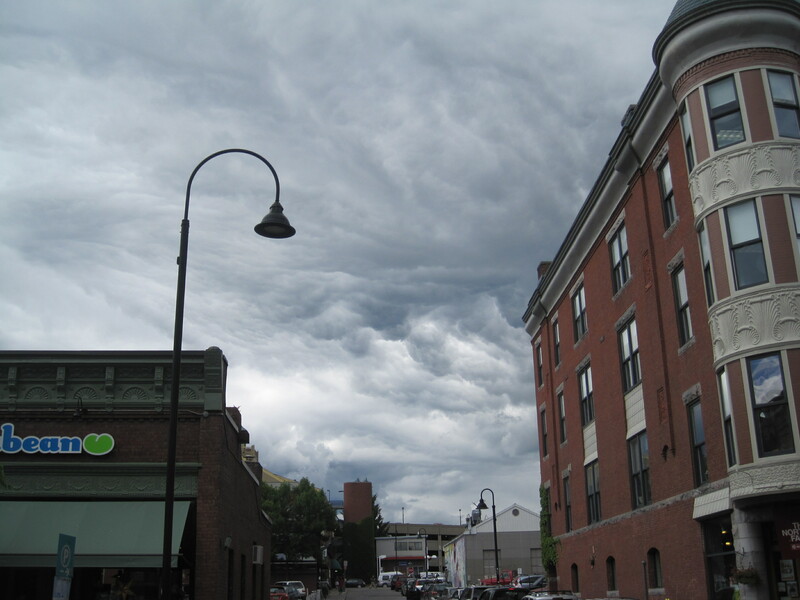 Turbulent clouds over Burlington Tuesday afternoon. Not much rain in Burlington, but St. Albans had a downpour and gusty winds. After an easy winter and a gloriously warm spring, the summer would turn wet and chilly. The period from January 1 through May 31 was the warmest on record in Vermont, according to NOAA. No good weather in Vermont goes unpunished, I always say, so of course it will cool off and turn gray for the summer. The weather could quickly turn around for a sunny, hot summer, but June so far is turning out stormy, rainy, cool and unsettled. I mowed my lawn in the rain last evening. With the rain, the parts I mowed seemed to immediately grow back enough to mow again. It cleared briefly last night, but now it’s clouding up, on the way toward a forecasted chilly, wet, damp Thursday. The weekend is looking kind of showery, too. Seems every day brings at least a chance of showers, bringing a serious element of guesswork to planning my outdoor work. Well, I guess I’ll avoid sunburn. This entry was posted on June 9, 2010 at 6:38 pm and is filed under Uncategorized. You can follow any responses to this entry through the RSS 2.0 feed. You can leave a response, or trackback from your own site.